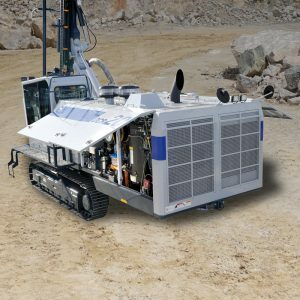 The DCR20 is a proven and reliable resource for drilling operations around the world. These drills have been tested in soft, medium and hard rock conditions with multiple end-users and applications providing deep holes from 3.5″ to 6.5″ at fast drilling rates with low maintenance. Servicing the DCR20 is easy. There is access to all key components – such as the engine, fluid levels and compressor – through large panel doors located at ground level for maintenance when needed. The redesigned cabs provide operators maximum comfort with single-lever drilling controls, large gauges and superior views of drilling operation. Cab is equipped with USB port. Model CAT C-13 meets Tier III and EU stage-3 Low-emission, low fuel consumption Tier III Caterpillar® engine meets major exhaust emissions regulations in Europe and US.